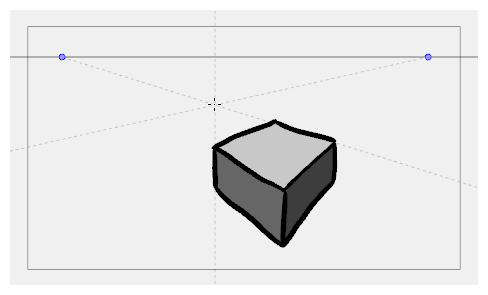 By default, all strokes drawn with an active drawing guide are straight lines that follow one of the guide's axes. To achieve a different style, you might want to draw with freehand perspective instead, where you use the guides as references, but without forcing your strokes to be straight and aligned with their axes. This can be done by disabling the Align with Guide option, which is enabled by default. The Brush, Pencil, Line and Eraser tools will no longer lock to your guide's axes, allowing you to draw strokes in any direction. The guide will still be visible, but will only serve as a visual aid. The initial angle of your stroke will still determine which axis you're using, but instead of locking your stroke on the axis, it will simply make the reference line for that axis bolder, to help you draw along it. In the Guides view, activate the Align with Guide button. You can now draw freely and use the guide as a visual aid.